A leader in the fields of animal ethics and neurology, Dr. Aysha Akhtar examines the rich human-animal connection and how interspecies empathy enriches our well-being. Deftly combining medicine, social history and personal experience, Our Symphony with Animals is the first book by a physician to show how deeply the well-being of humans and animals are entwined. Interwoven throughout is Dr. Akhtar’s own story of being a young girl who was bullied in school and sexually abused by her uncle. Feeling abandoned by humanity, it was only when she met Sylvester, a dog who had also been abused, that she found strength for both of them. Against the backdrop of her inspiring story, Dr. Akhtar asks, what do we gain when we recognize our kinship with animals? She travels around the country to tell the stories of a varied cast of characters—including a former mobster, an industrial chicken farmer, a Marine veteran—and comes face to face with a serial killer. Through storytelling that is entertaining, profound, and touching, Dr. Akhtar reveals what happens when we both break and forge bonds with animals. She demonstrates how humans are neurologically designed to empathize with animals, and how violence against them goes against our nature. In equal measure, the love and friendship we give to other species biologically reverberates back to us. Humanity’s compassion for animals is the next step in our species’ moral evolution and a vital component of our own health. Our Symphony with Animals is the definitive account for why our relationships with animals matter. 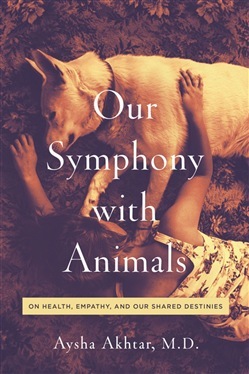 Acquista Our Symphony with Animals: On Health, Empathy, and Our Shared Destinies in Epub: dopo aver letto l’ebook Our Symphony with Animals: On Health, Empathy, and Our Shared Destinies di Aysha Akhtar ti invitiamo a lasciarci una Recensione qui sotto: sarà utile agli utenti che non abbiano ancora letto questo libro e che vogliano avere delle opinioni altrui. L’opinione su di un libro è molto soggettiva e per questo leggere eventuali recensioni negative non ci dovrà frenare dall’acquisto, anzi dovrà spingerci ad acquistare il libro in fretta per poter dire la nostra ed eventualmente smentire quanto commentato da altri, contribuendo ad arricchire più possibile i commenti e dare sempre più spunti di confronto al pubblico online.